Did Amelia etch her name in prison cell food door? 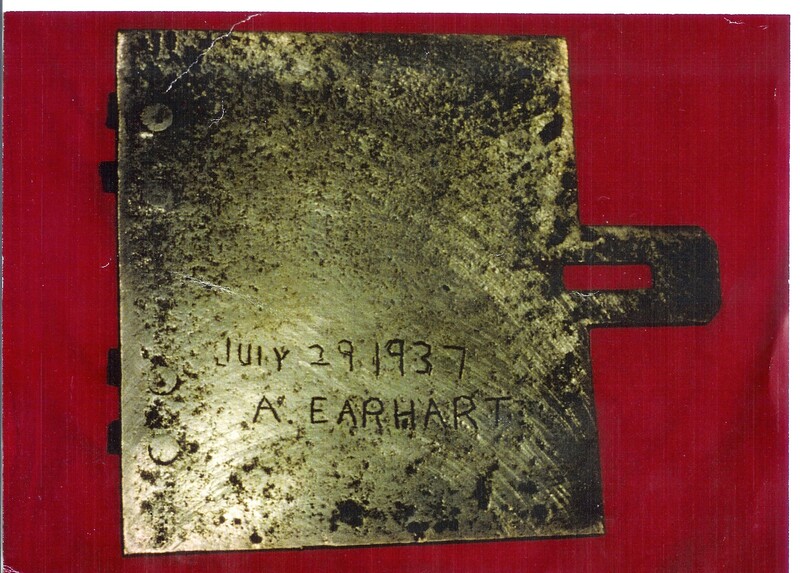 Whenever the discussion turns to the subject of the possible existence of “hard evidence” of Amelia Earhart’s presence on Saipan or the Marshall Islands, the metal door from the Garapan prison (or jail) with the provocative etching that suggests Amelia Earhart herself was the author is often mentioned. In With Our Own Eyes: Eyewitnesses to the Final Days of Amelia Earhart (2002), written with much help from Thomas E. Devine, we introduce a fascinating object that captured the imagination of Earhart fans, at least for a time. 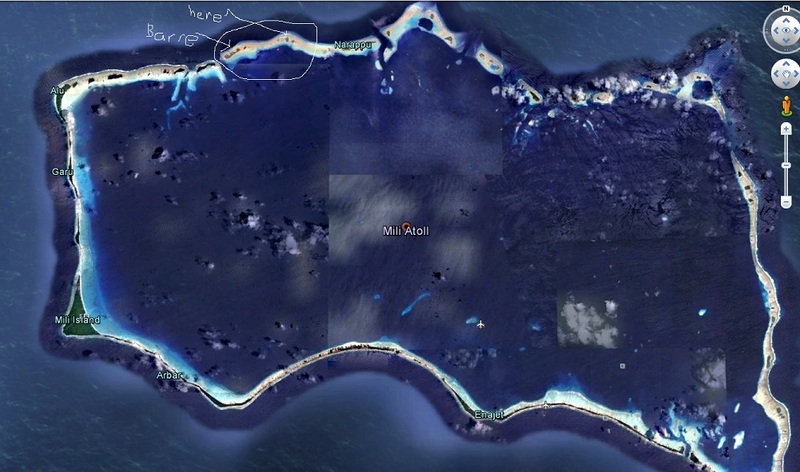 Since this potential evidence, if confirmed as legitimate, would have placed Earhart and Fred Noonan on Saipan, the public was never informed about it by our trusted media. 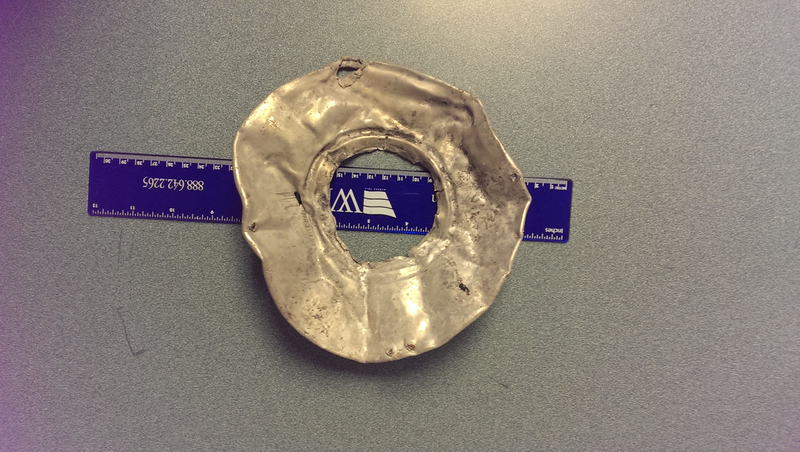 In May 1994, Deanna Mick, of Arlington, Kansas, contacted Devine about an artifact that had recently come into her possession. Deanna and her husband had established an air charter service at Saipan’s International Airport in 1978, flying the neighboring islands in a single-engine 180 Cessna. 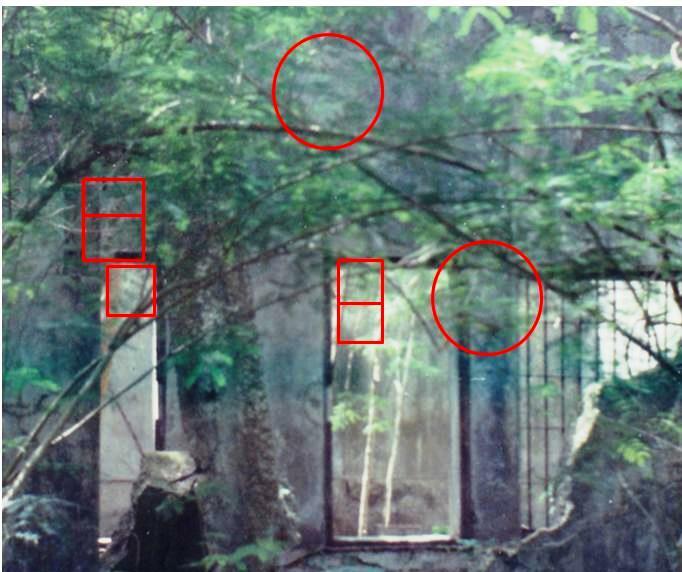 “Ramon said the door came from the Japanese prison on Saipan, and that it was used to pass food and other articles to and from the cell,” Mick wrote, and enclosed a photograph of the door. 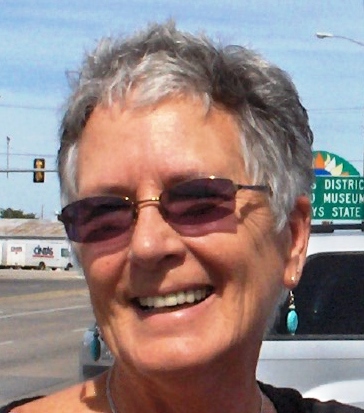 In a subsequent letter she told Devine that Ramon died in 1986, and that she had no idea when the door was taken from the jail. Ramon felt Deanna should have the door, Mick recalled, since she was the only woman pilot to fly the Marianas since Amelia Earhart. Ramon said he received it from a cousin on Saipan, who was positive Earhart was in the Garapan jail during the time indicated on the door, and that the etching came from her own hand. Devine believed the inscription may be authentic, and offered to pay Mrs. Mick for temporary custody of it. He would then have tests made to establish the approximate date of the inscription. When the tests were completed, he would return the door. “If a forensic test establishes an approximate date coinciding with the year of the Earhart disappearance, and with Mrs. Mick’s permission, I shall then compare this small door with the opening in the bars of the jail cell I had entered in 1944,” Devine wrote. 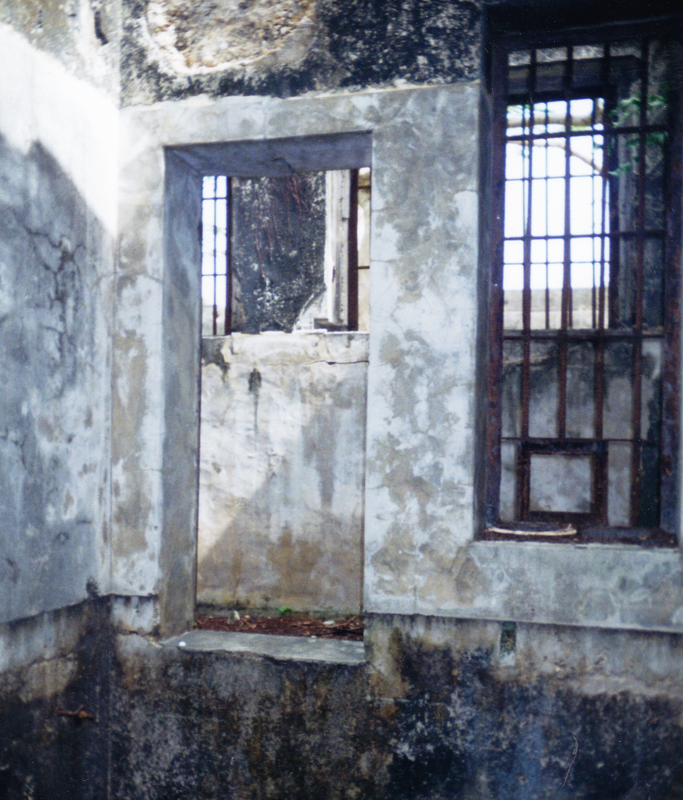 The inside of the cell at Saipan’s old Garapan prison that is said to have been occupied by Amelia Earhart. Former Marine and Saipan veteran Henry Duda took it during his visit to Saipan for the 50th anniversary of the historic 1944 Battle of Saipan. Note the larger square area at the bottom center of the barred window, which is where the food door was located. 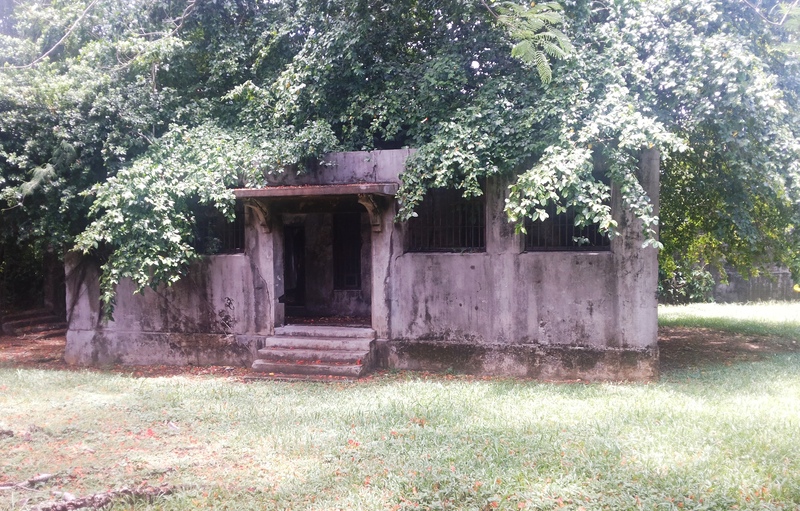 The door and its inscription prompted Devine to recall other details of his visit to the Garapan jail in 1944, further increasing the probability of the door’s authenticity. “I must report this,” even though I may be called a storyteller, or my veracity may be impugned,” Devine wrote in his unpublished manuscript, “The Concealed Grave of Amelia Earhart,” circa spring 1995. “On many occasions I have glanced at the photo of the door submitted by Deanna Mick. It has stirred my memory, and I do recall a door of that type on the bars of the cell that I had entered. As I lifted myself from the depth of the jail-cell floor, and grasped the swinging iron gate, I observed a few dark numbers on the dark metal opening. I believe this may be a coincidence, therefore I am seeking through Deanna Mick the names, addresses and any information that may ascertain that this may have been retrieved from the same cell. Since Deanna Mick has brought forth her artifact, perhaps I should no longer withhold what I had observed in the first cell from where we had entered the prison block, while investigating the pungent odor in 1944. In 1944, after having climbed up to the walkway of the cellblock with the pungent odor, I looked into the first cell and was very surprised at the depth of the cell, perhaps six feet down from the walkway. Facing directly into the cell, and about two feet from the dirt floor, were two letters on the wall. In 1944 I was fully aware of the presence of Amelia Earhart’s airplane on the island of Saipan, and assumed this incident was a top government matter and none of my business whatsoever. I never for a moment thought that Amelia Earhart had been a prisoner of the Japanese, and the name of her navigator had been relegated to secondary publication over a period of years. I never for a moment connected the letters “F N” to Fred Noonan, in 1944. Since I did not go down into this cell, I am unaware of any additional lettering that may have been placed upon the wall below the iron grating, unseen by the Japanese guards. It is quite possible that the lettering may have been blood, sustained by an injury, or it may have been a finger rubbing against the wall to induce bleeding. Rain would produce a dripping effect, and over a period of time perhaps eliminate the letters. That is, if it were blood. At any rate, the letters appeared to be finger width, and about four inches high. Of course the investigation that Devine dearly hoped would shine the spotlight on his extraordinary experiences on Saipan never happened, and is unlikely to happen in our lifetimes, or anyone’s lifetimes, for that matter, barring some kind of a miraculous intervention. That’s the view from here, anyway. When I put together the previous post about Eugene Sims and his “ghost of Amelia Earhart” photo, I had no idea what I was stepping into, nor did Sims when he took the photo of the cell at the old Garapan prison on Saipan in 1973. While the figure Sims thought could have been Amelia’s ghost was apparently only a trick of the lighting within the cell, the rest of the photo has opened up a Pandora’s Box of possibilities, thanks to my friend Laurel Blyth Tague Ph.D.
After beholding what Laurel’s discerning eye had revealed, I was ready to title this post “Welcome to the Amelia Earhart Paranormal Society,” but then realized that might be a bit too far out on the “fringe,” where our critics like to keep us. Admittedly, this and the previous post are complete departures from our normal menu of serious discussion of the Earhart disappearance, but after more than 70 such posts since July 2012, I don’t think a brief journey into the paranormal will hurt the cause appreciably. Laurel is the New York State director, host and managing producer for E.P.I.C. Voyagers Radio on the Inception Radio Network. I’ve had the privilege and pleasure of appearing twice with Laurel on her two-hour E.P.I.C. Voyagers weekly show, and she was the best-prepared, most intelligent and considerate radio host I’ve ever met. She’s also a trained observer of phantoms, or phantasms, or however these faces that appear in photos of allegedly haunted places can be described. I’ve seen similar faces on a website or possibly a book, but can’t find them now. I suggested to Laurel that these wraith-like faces are to photography what electronic voice phenomena, commonly known as EVP, are to audio recording. She agreed, and isolated the individual faces she found in the photos, writing a brief description of each. Most I can recognize, but some are beyond me. Forthwith is the great presentation Laurel put together; I hope you like it half as much as I do. Definitely EVPs are the gold standard of paranormal research: recorded voices saying things that make sense relative to the location and its history that are not noticed or heard by people at the time these utterances are collected digitally or on cassette tape. Only after later analysis – very careful and concerted attention to the entire audio – are these utterances heard. The ones I have heard from researchers are startling, both in terms of clarity and topic. My logic tells me that making a sound or noise or uttering words might require far less energy from “that other dimension” (for lack of a common expression) than moving anything in this 3D dimension. I see manifesting an image or a wispy, smoky haze as somewhere between these two ways to communicate in terms of difficulty. Head tilted downward, eyes also looking downward, eyelids mostly closed. Expression melancholy. Right side of nose in light, tip prominent by shadow beneath and to left. Lips slightly compressed, two lips visible. guess I should throw in the insertion of smells and thoughts (often reported), especially when a close relative or friend passes. These I would place a little easier on the scale of ghostly talent than even creating audio evidence. In fact, I think that these four types of evidence are collected on a scale of frequency in the same order: thoughts and smells, sounds and words, images and hazes, moving or relocated objects. What we present here for your consideration is simply meant as food for thought, at the very least entertainment. When I read Mike’s most recent blog Eugene C. Sims and the “Ghost of Amelia Earhart”, I stared and stared at the photo and thought Sims must have been pointing to the highly lit feature in the middle of the central doorway, consisting of two parallel vertical lines and topped by what could be horizontal shoulders and a skull. I thought, no, this is just too easy – that has to be the way the light is shining into the cell through the jungle foliage. Head tilted up and to right slightly. Eyes open, left eye in shade. Nose prominent by light, nostrils shaded. Mouth in relaxed expression Chin beneath mouth, shadows on neck beneath chin. Dark fabric visible coming off left shoulder sets off neckline. This tendency for humans to perceive scant visual stimuli and then attribute meaning to them has long been one very handy survival skill in our evolutionary toolkits. Granted, sometimes we may read too much into what we see. Nowadays the paranormal investigation community strongly warns fledgling researchers against matrixing. Head tilted downward, eyes looking down, heavy eyelids. Nose prominent by light, face more shaded on left side. Right cheek accentuated by light. Both lips visible,slightly parted and slightly pursed Contour of face from cheek to chin visible on right side just to right of lower lip. Lighter feature below lips and chin suggests a left hand holding a cigarette, her expression suggesting she is getting a light from someone. Tip of cigarette visible near bottom center of image. Pareidolia is the imagined perception of a pattern or meaning where it does not actually exist, as in considering the moon to have human features. Devotees of paranormal investigation have come to use the term matrixing to mean much the same when referring to the observation and interpretation of specifically visual information. What is interesting to me is the implication inherent in this definition that whatever we think we are seeing is not really there: in other words, we are making it up by our interpretation, foisting upon the image qualities it does not truly have. There is almost the connotation that we are trying to fool others by stating what we see in the image, or at the very least we are demonstrating publicly that we are gullible fools. Another option, putting both B and C together as a whole image. Below the face described in B, the image from C now suggests her upper torso, dark [leather?] jacket open in font with lighter color shirt open at neck, or lighter color ascot or scarf tied at neck and tucked in. If Amelia ever smoked a pipe, it could explain the dark linear object protruding from her mouth. Many women did/do. Well, I can think of examples of certain individuals involved in researching Earhart’s final demise who might well be described in this way. So I saved the [Eugene C. Sims] image and opened it in a couple different apps I use to enlarge images and study them in greater detail. Immediately I saw that what appeared to be long, skeletal legs are indeed bamboo stalks or some other kind of flora, and that skull is just a big leaf. I laughed to myself, remembering one of my favorite Peanuts strips ever, where Linus, Lucy, and Charlie Brown are looking at clouds and telling each other what they resemble. Notice the goggles above the face, on the front top of head; two brows, eyes in shadow beneath, slight smile; looking over right shoulder. I thought, before I closed my app, I would poke around and look a bit, just to see if I noticed anything resembling a face or person, especially those of a female. I noticed three female faces almost within mere seconds and managed to find three more after really scouring over the image. I prepared little guidelines next to each extracted image I found, explaining what I saw, hoping to help someone else see what I did. After emailing these to Mike and a couple other close friends (“open-minded” friends, I might add), one of them came back with a seventh woman’s face! 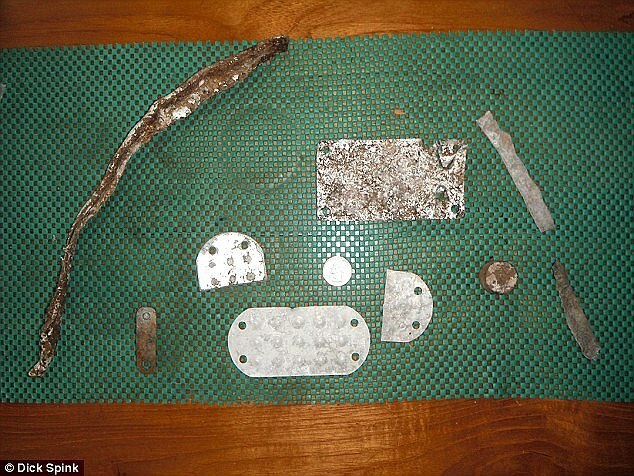 What we present here are these extracted images with additional pointers to help with locating them in the larger image. Head tilted up and to right. Right eye looking upward slightly, brow above. Nose tip below, strong shadow beneath to upper left of mouth. Mouth below. two full lips visible, in a relaxed posture. Strong chin below lips. At least some of these faces will stubbornly refuse to materialize for some of you. These details are best recognized at a certain resolution — too enlarged and it just looks like a gray mulch, too reduced and it looks like a more linear gray mulch. Viewers should play with zooming in and out by bits until the image pops out at them. The images here are at the best resolution for me. I am fiercely intellectually curious and open-minded but I would not say gullible. There are many things in this world that are not yet resolved or explained fully, because all the facts are not on the table and in many cases adequate technology or methodology are lacking. One reader here asked why Amelia would haunt a location so completely imbued with agony and grief for her, to which another reader answered perhaps she is merely making her mark on this image at this blog, a place where we continue to question and dig and discuss until her true fate has been demonstrated and accepted by the public. This sounds to me like a plausible answer, and I hope each of you finds these images and comments at the very least thought-provoking and entertaining. Head leaning to left. Face slender, eyes shut. Hair over right eye, covering it. Left nostril darkly shaded and prominent. Mouth looks open, agape, as if snoring in sleep. Right contour of chin visible and part of neck. Lighter feature below face in lower right portion of image could be arm, hand or something like a pillow on which the head is resting. Reminiscent of a death portrait. Every now and then I see a photo and – if I can assume it’s legitimate and not doctored – it is probably even more stunning to me. I never expect/demand that the image matches a pose from a photograph of the person. This seems ridiculously pedantic and artificial to me – what of all the people who died before photography and were later seen as ghosts? How does a dead person select the exact photo s/he wants to use as the calling card in these instances? 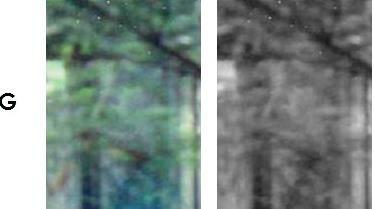 Not to mention, doesn’t it make more sense that a ghostly image in a photo that does match an old photo of that person, stands a better chance to have been technologically superimposed on the newer photo? So it does not bother me that I do not see Amelia’s face, as in press photos, in these. The one with what I see to be goggles on her head is impressive to me. Profile of face looking toward left of image. Forehead, beneath that brow and skin area above eyelid. Eye is half open, looking straight ahead. Cheek prominent by light, compared to shadow alongside the nose. Nose is somewhat short but straight. Two lips and chin toward bottom half of image. Laurel sent the images to a well-known paranormal “expert” for his opinion, and he told her that this phenomenon is known as simulacrum, meaning “something looks like something it isn’t. Sort of the same thing as figures in clouds, etc.” He didn’t seem impressed, but since I’m not a paranormal expert, I’m free to reject the idea that these images can be attributed to pareidolia, matrixing or even this fancy “simulacrum“ term, which I consider to be a dodge. If we’re seeing something “that doesn’t exist,” why are we seeing the same things in these photos? I think B+C looks a lot like Amelia, for example. And why do these faces appear almost exclusively in photos of notoriously haunted locations? I think these faces might be those of discarnate or disembodied entities trapped between planes of existence, between heaven and earth, so to speak, who for whatever reason cannot move on into the light — or the darkness, if that’s their destiny. Or could these some kind of lower-level demonic entities, lingering in a location renowned for evil doings, seeking new hosts or victims to torment? How do you explain this, readers? What do you think? Let us hear from you!